Most international visitors that come from overseas don′t spend all of their vacation in the same spot. They usually want to combine several highlights in Central Europe in as little time as possible. Popular destinations for a combination with Salzburg are Innsbruck, Vienna or Munich - as well as Venice, the pearl of the Adriatic Sea. In the past, readers of Visit-Salzburg.net have e-mailed us regularly to ask about public transportation and the best mean of transport between Salzburg and Venice. There are several possibilities to travel from Salzburg to Venice or the other way round. The distance between Salzburg and Venice is approximately 280 kilometres. However, keep in mind that the Alps are in between. This increases the travel time dramatically and beyond what most people would expect given the moderate distance. Nevertheless, getting from Venice to Salzburg is no big hassle from the logistic point of view. We have looked into various options for travelling. 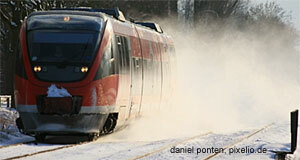 The Austrian National Railway (ÖBB) operates a direct link between Salzburg and Venice called "Allegro Don Giovanni". The serves the route twice a day, departing from Salzburg once early in the morning and once late at night. The journey of the train, which actually starts at Vienna and travels via Linz and a few other stops to Salzburg, takes anything between a bit more than 6 and an impressive 11 hours. However, this is due to extended stops and painfully slow progress on the Italian side, so that a train that has departed from Salzburg just before midnight arrives in Venice at 8:30 am the next day. There is a good train link that departs from Salzburg in the morning and arrives in Venice in the early afternoon. There are seats and beds available on this train. In addition, there are other links that are (even?) less convenient. One reader of this website has e-mailed us with the suggestion to take the train via Innsbruck and stop by at the city. Innsbruck is indeed worth a visit and the compact city centre can be explored within a few hours. The route from Salzburg to Innsbruck and then Venice is more scenic (as our reader has pointed out correctly), but longer and thus more expensive. Speaking of the price: The direct train link between Salzburg and Venice always has a stock of tickets that sell very cheaply at 29 Euros one way. You need to book well in advance to get these tickets, though; otherwise, the journey can be significantly more expensive. If you are under 26 or plan to tour Europe for an extended period of time using trains, Interrail tickets will probably be by far the cheapest option. The train journey from Salzburg to Venice runs via Villach, Udine, Aquileia and a bunch of other Italian cities; it arrives first at Venice Mestre (the "mainland" Venice) and then at the actual lagoon at Venice St. Lucia. We have not come across any scheduled bus lines between Venice and Salzburg. There is a company that operates busses between Venice and Klagenfurt which go via Udine, but we are not sure to what extend they are more convenient or cheaper than trains. Besides, they would still not save you of the hassle of going to Klagenfurt before; whilst Klagenfurt might well be an attractive stop-over destination to make the journey to Venice more attractive (and get a break from driving), a change of the means of transport is not recommended. We have not found any direct flights from Salzburg airport to Venice; keep in mind that both cities are medium-size and only 280 kilometres away from each other. We therefore consider it unlikely that a flight connection between Salzburg and Venice would make sense. We do know, however, that many private airplanes travel between Northern Italy and Salzburg. There is relatively little we can say about this option. There are of course all the major car rental companies present in both Salzburg and Venice (two of Europe′s most touristy cities) and they certainly offer deals where you can take the car from one place and return it at the other. In Salzburg, most rental car companies operate offices at the airport and near the station. They also offer taxi services. Keep in mind, though, that both Salzburg and Venice are expensive and renting a car will not be cheap at all; it will be hard to find a bargain that could compete with special train offers or Interrail package deals even if you travel in a group of four or five, splitting the costs. However, there are several nice places worth exploring on the way - especially the mountainous areas of the National Park Hohe Tauern and several towns in northern Italy.